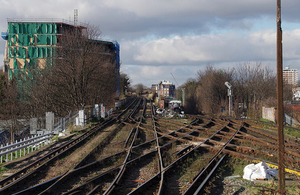 View from Lewisham station towards London (Photo by Matt Buck on Wikimedia Commons. Used under Creative Commons). The RAIB’s investigation has focused on the safety learning relating to the initial unsafe passenger detrainments. While incident and recovery management actions are broadly described, they were not the subject of detailed examination by the RAIB. The initial detrainment occurred because of the time the train had been held at the signal. Passengers were getting increasingly uncomfortable in crowded carriages with no toilet facilities. Ultimately the motivation of passengers to leave the train outweighed the effectiveness of encouragements to stay on board. a near-by mobile operations manager, who was trained and equipped to de-ice the conductor rail, was not alerted for 40 minutes. The length of time during which train 2M50 was prevented from moving into a platform was extended due to a decision to route it directly behind train 2M48, which then struggled to move. This meant that train 2M50 came to a stand at a signal beyond the point at which it could have been diverted into another platform. Having made this decision the signalling staff still had the option of applying a Rule Book regulation known as emergency permissive working. This procedure would have allowed train 2M50 to pass the stop signal and enter the platform once train 2M48 had moved far enough clear. However, the first passenger left train 2M50 before signalling staff decided to implement this regulation. It is likely that the delay in making this decision arose because the train was not declared as stranded in a timely manner, and inadequate management of the disruption caused by the adverse weather. Because the emerging situation at Lewisham was not recognised as a serious incident sufficiently quickly, key decisions were not made to define and implement plans to manage the circumstances. Other factors included informal communication using inappropriate channels, poor presentation of key operational information and ill- defined incident management processes. the visibility and communication of information to and within railway control centres. signallers and staff in railway control centres following appropriate protocols when using voice communications. The implementation of safety learning identified in this report would have greatly reduced the impact of the incident on other trains that became stranded, and the wider service disruption that occurred as a result. “To be stuck on a train that is not moving can be an unpleasant experience. Add to this a crowded commuter service, limited information and no toilet facilities, and the result is a situation that none of us would want to be part of. “Our investigation has focused on the circumstances which led some passengers to get out of the trains and walk along the tracks which were still open to traffic, in proximity to a live conductor rail. We have considered what could have been done to prevent a relatively minor event involving one train escalating to involve numerous other trains and thousands of passengers. Our investigation highlights the importance of decisive action in the early stages of an incident involving a stranded train. “Our major cities are reliant on rail services to convey many millions of passengers on a daily basis, relieving pressure on road networks that are already congested. Achieving this herculean task requires a high frequency of train services and rolling stock that is capable of conveying large numbers of people. Generally, the rail network is able to meet this challenge. However, on such high density routes, serious delays can themselves be a safety issue because on-board conditions can deteriorate rapidly and frustration and discomfort can lead to people taking matters into their own hands, putting themselves at risk of being struck by a train or electrocution. “Professionalism in railway operations includes the ability to anticipate how a situation may develop. Today, signallers and operations controllers oversee large areas of the rail network which means that they have the role of front-line managers for incidents like this. It is important that the training they are given equips them for this role. When conditions outside are challenging, and things are not going entirely smoothly, thinking in a more precautionary manner about the possible consequences of a particular move may pay dividends. In this case, bringing a train close up behind another that was having trouble moving forward blocked a set of junctions in a way that soon trapped eight trains. Furthermore, prompt application of existing emergency working procedures, which had been designed for just this situation, could have unjammed the railway and got trains on the move, and people safely on the way to their destinations. “We are recommending that the railway industry takes action that will minimise the risk of trains becoming stranded in icy weather. However, since the effects of the British weather can never be entirely overcome, and given the range of other factors that can disrupt the operation of the railway system, our other recommendations relate to the need for better management of the consequences of a stranded train, so that the railway remains in control of events and people are not put at risk.